My Friday off of work started out foggy but the sun soon broke through. By 8:30 I had my bike rolling southbound towards Seattle. 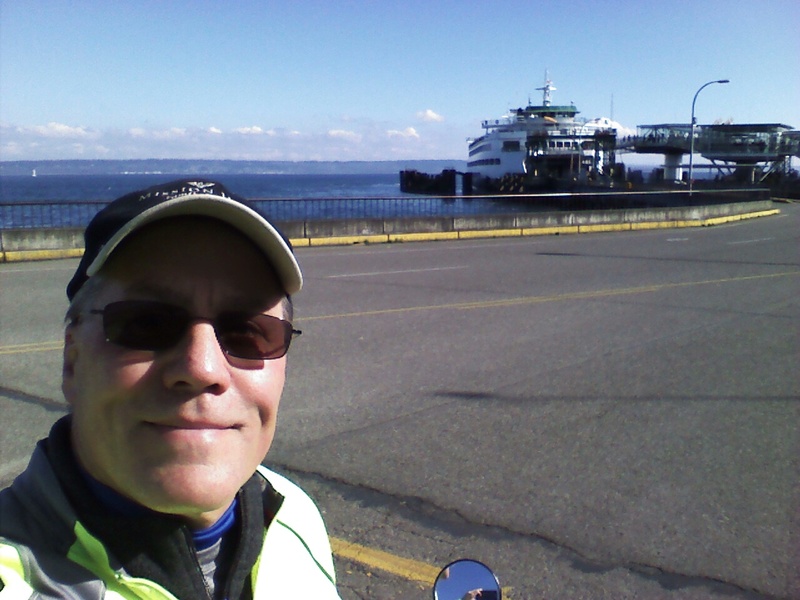 My plan was to hop a transit bus and start my riding on Seattle’s Bainbridge Island. This island was recently the scene of the annual Chilly Hilly 33 mile ride. I missed riding that event but planned to follow the same route as it was touted to have some pretty tough elevation gains. I adjusted that plan when I realized I could almost pedal as fast as the bus. I rode past the bus stops as I peddled on southbound. The down side to this plan was that I was expending a lot of energy I would need for the Bainbridge Island hills. I traveled the same Highway 99 route I have taken before. 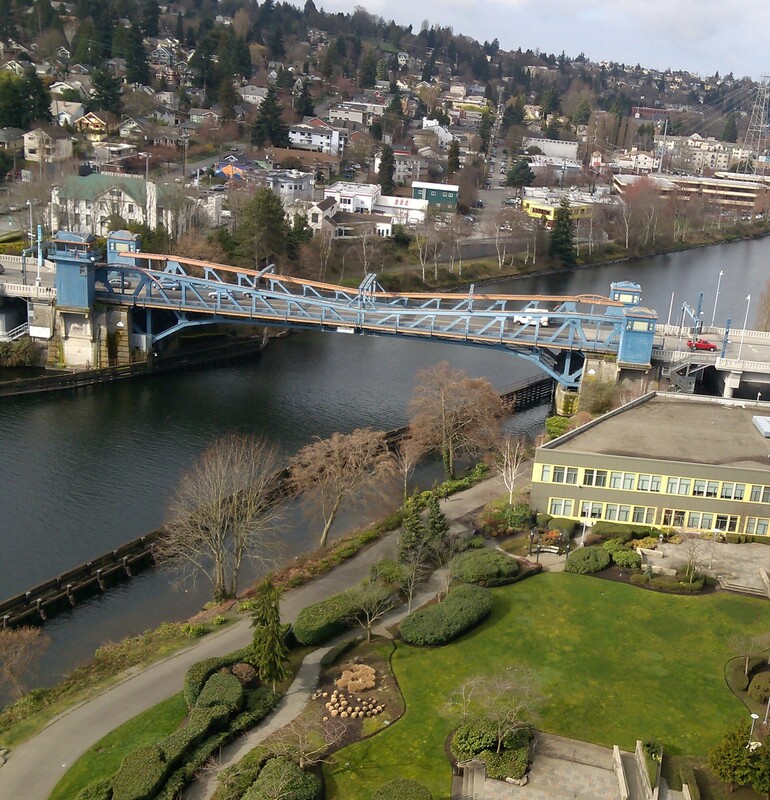 I adjusted that route at Lake Union and took the George Washington Memorial Bridge. 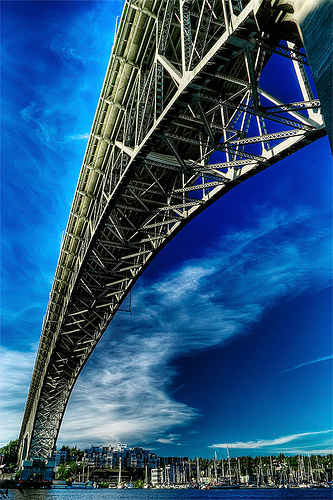 I added this photo I found on the web to give you an idea of how cool this bridge is. This bridge was built in 1929 and was the final link in the Mexico to Canada, Highway 99 (Also known as the Pacific Highway Auto Trail). 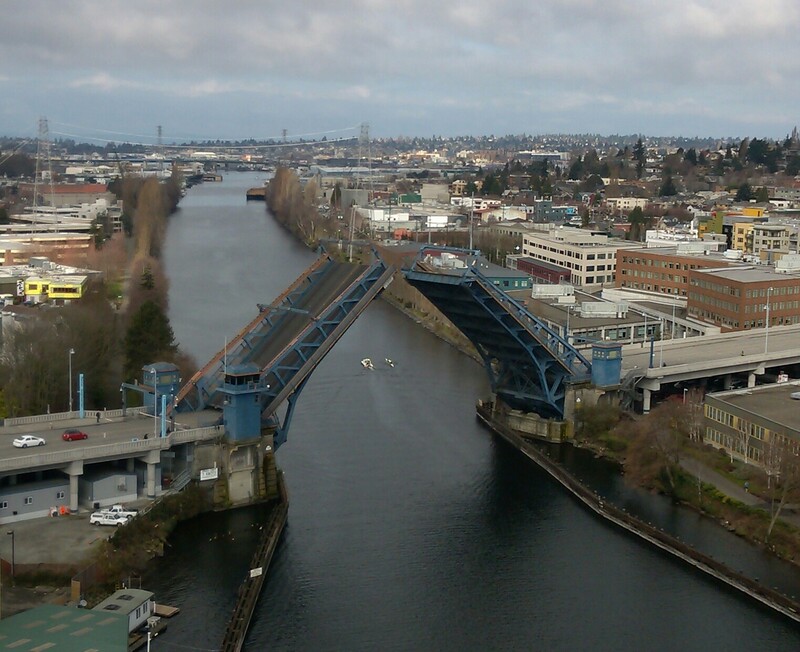 It is almost 3,000 feet long and when looking down the waters of Lake Union are approximately 200 feet below. Unfortunately, since it was built there have been at least 230 suicidal people jump from its edge. A few years ago millions of dollars were spent to add eight foot tall barred fencing in an effort to keep people from jumping. I was able to get a different perspective of the Freemont Bridge to the west which I had traveled and wrote about weeks ago. Before I reached the south end of the George Washington Memorial Bridge I heard the Freemont Bridge horns blow. This sound is to give warning to all of the bridge is raising to allow a large ship through. The funny part is, look at the size of the boats they had opened the bridge for. 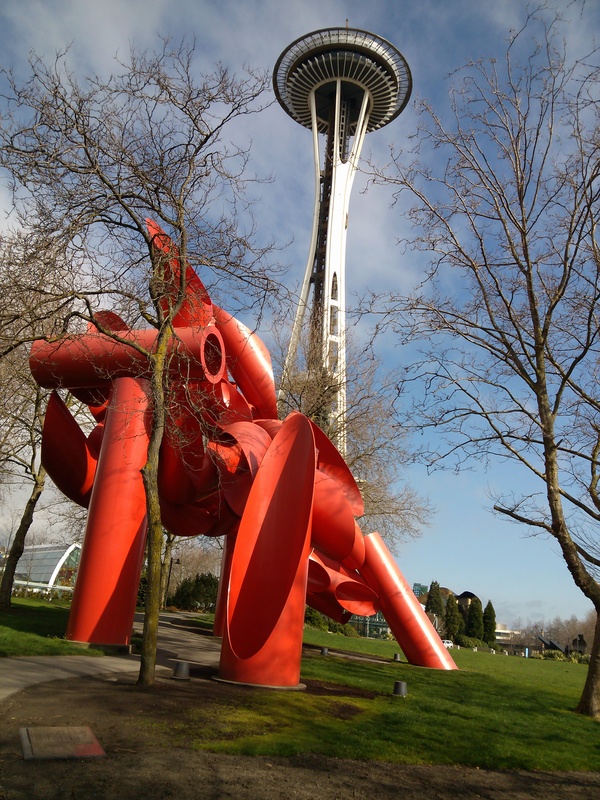 I continued on my trek south and was soon in the Seattle Center area. 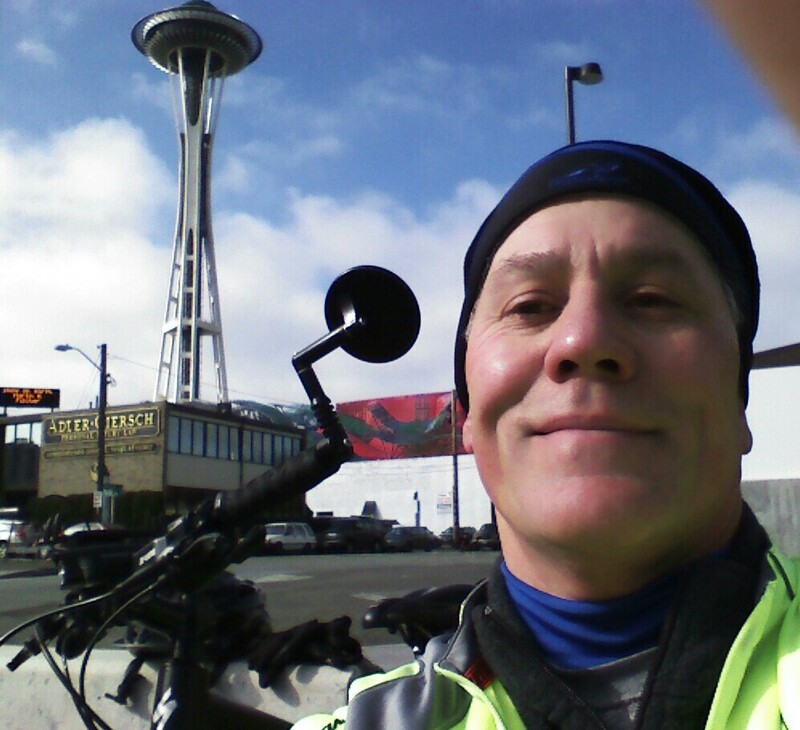 I was biking below the Space Needle which was built for the 1962 World Exposition. Even though it is not the prime tourist season there were many out enjoying this cool but sunny day. I rode around the center for a bit checking out the abstract “Art” and the Experience Music Project. I headed west to the pier and took the path which runs through sculpture park. I was able to take in the great views of the salt water and islands to the west. 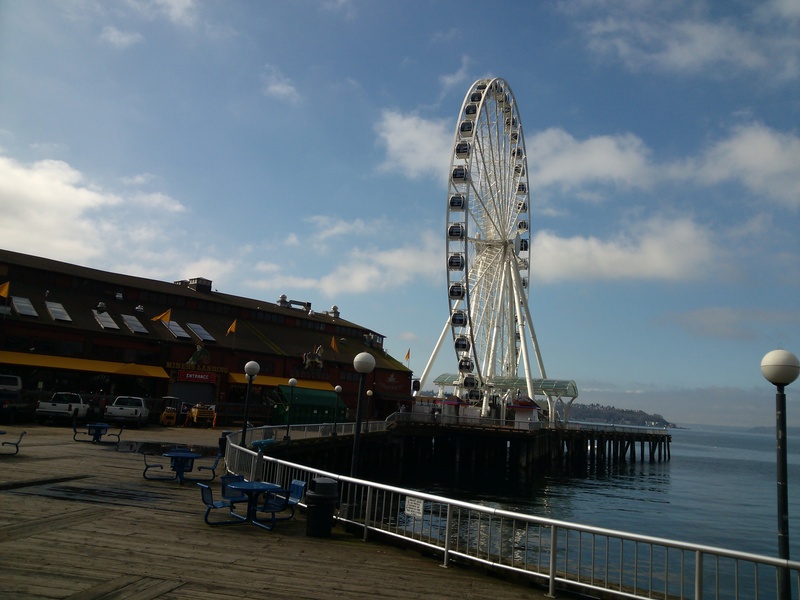 I stopped at Ivar’s on the pier and bought some clam strip, chips, and clam chowder to go. I took my calorie rich lunch with as I waited for the next Bainbridge Island ferry. Once I was on board, I enjoyed my lunch and view for the 35 minute boat ride. By now I had decided to adjust my plan. I mapped out a route that would take me north on Bainbridge Island to Kingston. This was my first time exploring Bainbridge Island. I recognized that it was a very bike friendly place as evidenced with the many bike rental shops and bike lanes in the street. This island has become know as a bed and breakfast destination for many. As I exited the downtown area I saw a lady walking three… no two dogs and one miniature horse. Now that is something you don’t see every day. I took a route that followed the east shore of the island. The scenery soon turned to farmland and woods. 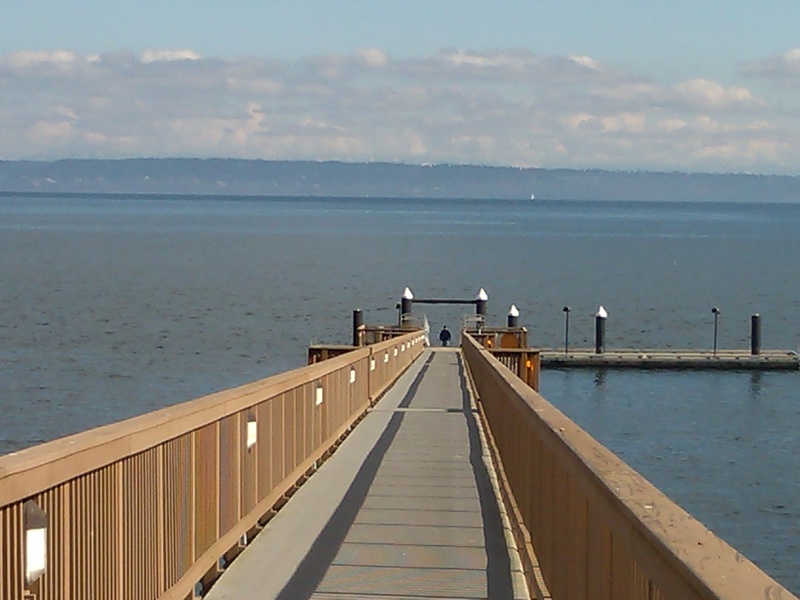 I took the Agate Pass Bridge which had Port Orchard Bay to my left and Madison Bay to the right. This part of the ride was not family friendly as there was much traffic flying by and little room between the roadway and bridge edge. Once off of the bridge, I worked my way through the Suquamish Indian Reservation. I took a short break for some water and a photo opportunity. I was soon in Kingston. I had not been here since I took my Hurricane Ridge ride last summer. Once again it was a short ferry ride to Edmonds. I ground uphill from the ferry dock and had a great view of the Olympic Mountains as I traveled along familiar turf. I was glad to see my apartment complex as I had logged 69 miles on the bike this day. I feel that I’m getting closer to mountain climbing shape and long for the snow to melt from those roads. 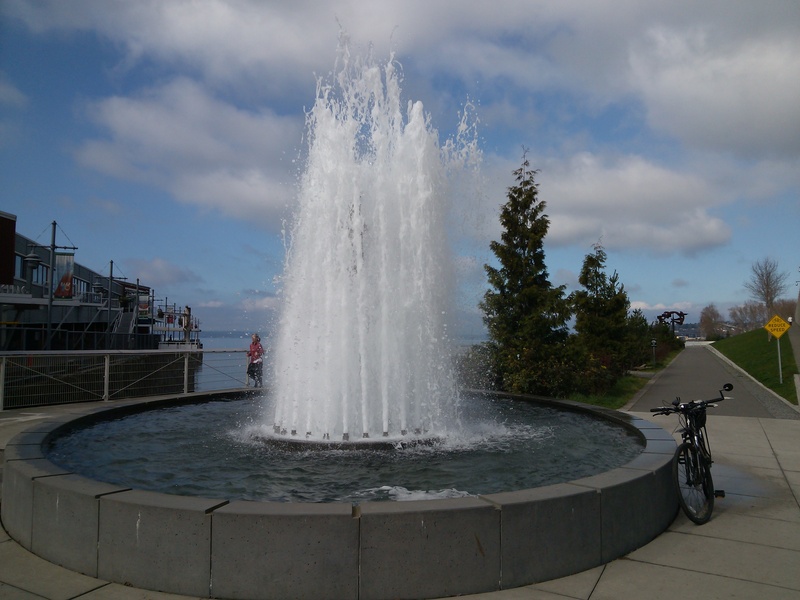 This entry was posted in Bainbridge Island, Bicycling, Bridges, Edmonds, Ferry, Freemont, Mukilteo, Photography, Seattle, Space Needle, Washington State. Bookmark the permalink. Oh man, you’re getting very polished with your writing and photos. I love that pic of the GW bridge with the clouds painting the sky. Keep ’em coming pal, I won’t miss a single episode. Thanks Kat, I appreciate you following me.